Home again, home again jiggity jog…… What a trip that was, three weeks so full and enriching and reviving that it felt like we were gone for two months. So I suppose we got our money’s worth. And our time’s worth. But it’s great to be home. Another sign of a good trip!! Great restaurants and stunning countryside, inspiring history and phenomenal markets — but in the end it’s hard to beat the comfort of being back in your own bed. Planes, trains and automobiles. Five different flights got us from Seattle to Rome, then from Paris back home again. Trains of varying speeds and spiffyness took us from Rome to the Tuscan countryside, from Florence to Nice (via Milan), then from the byways of Alsace into Paris. And in five days of car rental I motored over 800 kilometers from Nice to Arles, around the Camargue, through Burgundy and eventually dropped our Renault off at the Strasbourg airport where Alsatian friends picked us up. We went. We saw. We conquered museums, markets, meals, and miles and miles of countryside drives and city walks. With nearly 1000 photos to organize and nearly as many experiences and impressions to try to capture, it may be a while before a cogent recap of this trip gets posted. If ever that really happens. But some off-the-cuff highlights and random thoughts. b) Pop-up music/performances abound in Europe. In Arezzo it was a small stage set in a town square with ballerinas practicing for an event of some kind, as we sat nearby on a restaurant patio having lunch. 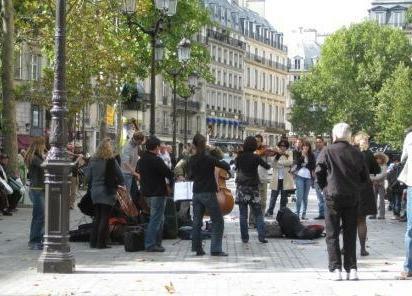 Sitting at a cafe in Paris near the Palais Royal, we were serenaded by a string octet performing beautiful classical pieces. On the Pont des Arts near the Louvre, it was an American high school band doing their thing. An all-time favorite Paris memory is being on the metro and a guy jumps on and starts singing Blue Skies, one of my very favorite songs. I will never tire of unexpected art of this fashion. 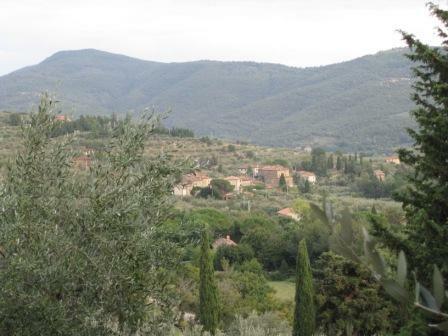 c) As might be predicted, our vistas when driving around the Tuscany countryside for a couple of days rarely lacked for an olive tree or two (or two hundred). The region surely lives up to its reputation for locally-made olive oil. But this was a surprise: I asked our friends about those lush fields of hip-high, vivid green plants with broad leaves. Would you believe that Tuscany is also a big producer of tobacco? Could have fooled me! And we saw lots of fields of it in our time there. d) In Florence we did go to the primo museums that every tourist really should visit: the Uffizi (with many special pieces of art, the highlight for us Botticelli’s “Birth of Venus”) and l’Accademia (David). In Paris we skipped the Louvre and the Grand Palais, opting instead for the Henri Cartier-Bresson Foundation‘s exhibit of black and white photos by Harry Callahan (which inspired a handful of b&w shots following the visit) and the Musée National Eugene Delacroix in the home-studio the artist lived in literally around the corner from the hotel where I always stay in Paris (never having known the museum was even there). 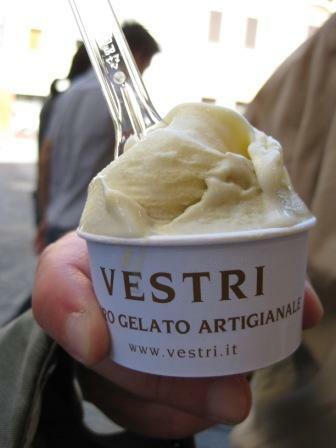 treats of Vestri also in Florence (I tried pistachio and vanilla there). To be honest, though? Best gelato I had on the trip was at Amorino in Paris. Twice. f) When in Rome, do as the Romans. And when in the Black Forest, eat a piece of Black Forest Cake!! A fun surprise addition to our itinerary was one day driving to, and through parts of, the Black Forest in Germany. I knew of course that Alsace is on the German border, but didn’t realize my friends’ home was so close as just 25 km or so from Germany. One day we headed that way and got a tiny taste of lovely German countryside, surprisingly distinct from the Alsatian countryside so nearby. I couldn’t NOT try the traditional chocolate-cherry-whipped cream cake while there. Very simple and quite delightful. Look really forward to going back and exploring the region more. 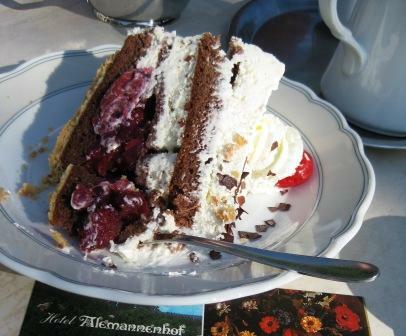 The real deal: Black Forest Cake, in the Black Forest! Heavens. So many more pictures!! And so many more stories they evoke. But they’ll have to wait for another time. Hope you enjoyed this little sampling. It was already pretty wonderful just to be in France at all for those nearly three years I spent (mostly) working and studying at La Varenne. But on occasion a really magnificent, unexpected, enchanting experienced came along to make the stay even more magical. This was one of those occasions: a very cold, foggy January weekend in Burgundy, reveling with other wine lovers in the celebration of Saint Vincent Tournante. 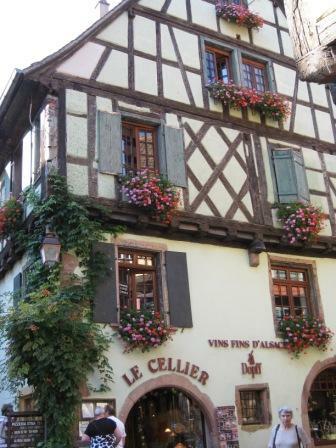 This past weekend the festival was held for its 71st year, one of the most distinctive annual events that reflect the deep heritage of wine making in Burgundy. Saint Vincent is the patron saint of winemakers and since 1938, the winemaking villages of this region have shared in celebration of their saint. “Tournante” reflects the fact that the festival moves from one village to the next from year to year. I don’t recall exactly how we learned of the festival back in 1991, maybe an item in the International Herald Tribune or a personal recommendation from someone at the school. My pal and I borrowed the school car and headed out early for the 2-hour drive south from Joigny to Puligny Montrachet, where the festival was held that year. It is certainly possible that some elements of the festival have changed since then, but a quick glance at this year’s overview rings familiar. The day’s activities included a parade with winemakers representing the different villages of the region (each carrying a statue of Saint Vincent), and many caves (wine cellars) in the village open to attendees for barrels samples. We paid something like 20 or 25 francs for an official festival glass, and simply went from cave to cave for samples (some direct from the barrels) at no extra charge. The experience was not only festive–a fun diversion on a cold Saturday–but also made me a forever-fan of the white wines of Burgundy. Most of the Burgundian appellations for white wine use only the Chardonnay grape. But as far as I’m concerned, there is white Burgundy, and then there’s the whole rest of the world of Chardonnay. The two are just completely different animals in wine’s wild kingdom! In fact, I paid $22 for a glass of white from Burgundy during our dinner at L’Atelier to Joël Robuchon in Vegas in December, and so delighted in each sip the price was of no consequence. The festival honoring St. Vincent was incredibly relaxed, convivial, no pomp or commercialism. You can see how easy it was to feel part of the celebration, as I joined the parade itself for a few paces! There was nothing at all “touristy” about the experience, it was a glorious opportunity to meld into the local culture without any kind of visitor’s filter. The one element of the festival I found most engaging was the way the village was decorated. Being dead of winter, of course trees were bare, no flowers or other blooms in sight. Nonetheless, trees and fences were adorned with colorful flowers–made of paper–adding some flair and as a reminder that spring is just around the corner. If ever you find yourself in France near the end of January, I recommend you Google “saint vincent tournante” and find out details about where the festival will be held that year. I know it’s on my list, to find an opportunity to return myself. When I left for La Varenne cooking school back in the summer of 1989, I thought I had a tidy 9 months ahead of me. But what already was clearly going to be a fascinating adventure became even more so when the excursion got extended a few different times and became 2 1/2 years of French bliss. I finished my degree as planned, but stayed on for new opportunities that presented themselves. It became something of a bohemian lifestyle, moving a lot, often back and forth between Paris and the northern Burgundy countryside where the school’s Château du Feÿ is located (and currently for sale, if you’re in the market for an amazing château property!). Even in Paris, I lived many different places: a spare room in a family apartment, a spare apartment in the La Varenne building, even on a friend’s couch in the Austrian Embassy for a week or two (he was the chef and I was between gigs). By far my favorite spot, though, was the tiny apartment where I hung my chapeau for 6 or 8 months while working for Patricia Wells and still keeping my fingers in some La Varenne work (just prior to Anne Willan having begun the Look & Cook book series, which kept me in France for another year). The bed in this very small nook of an apartment, on Rue de Trois Frères just below the basilica Sacré Coeur in Montmartre, was on a platform raised above some of the living space. The kitchen so small I had an under-counter fridge and just 2 electric burners with which to cook. Did I mind? Not in the least. To have any Paris real estate to call my own was like heaven, and my windows looked out onto a backyard garden with a peek-a-boo view of the Eiffel Tower. regular at the nondescript café Le Favorit on my block and took advantage of amazing to-go foods available at nearby markets. 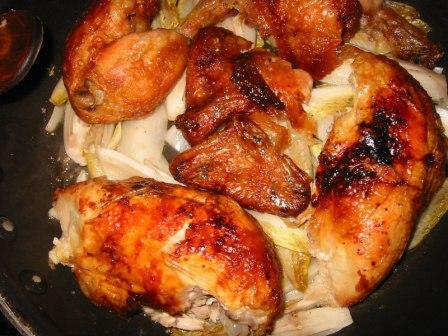 I did come up with one “signature dish,” however, inspired by this experience: chicken with endive. Now and then, on my way home from work, I’d buy half of a rotisserie chicken from a streetside vendor and pick up a few heads of Belgian endive. With just a skillet, a dab of butter and a few splashes of white wine, this became such a satisfying meal for such limited resources. It was with that dose of nostalgia that I recreated the meal a week or two ago. 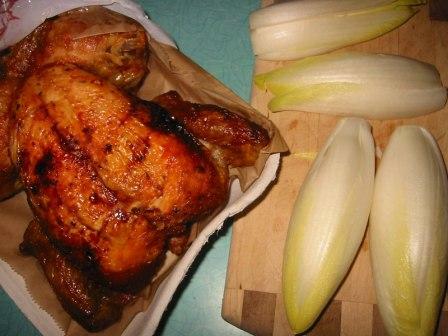 I bought a whole rotisserie chicken at the grocery store and a bunch of endive, reliving for a moment the delicious simplicity of that slice of my life back in Paris. I halved the endive heads and cut out the core at the base of the leaves, which harbors bitter flavors. Then halved each piece again into quarters. 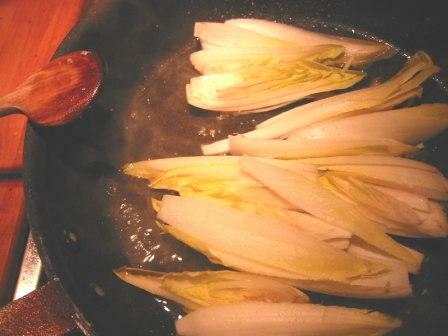 After heating a combo of butter and olive oil in a skillet, in goes the endive to saute for a bit. I don’t stir much, more just gently swirling the skillet and carefully turning the endive pieces; ideally I try to keep the portions together as much as I can. Though the random few leaves that separate? They’ll just caramelize a bit more and bring some extra, lovely flavor to the dish. It’s all good. When the endive had started to soften and seemed about half cooked, I topped it with the portioned chicken. I drizzled a good 1/3 cup or so of dry vermouth into the pan, topped it loosely with a piece of foil and reduced the heat to low. Twenty minutes or so later, the endive will be tender, the chicken will be gently reheated and dinner will be ready to serve. If there’s liquid left in the skillet or the endive looks a bit pale, crank up the heat for a minute to polish things off. As part of the local Cooks & Books series, you can join Patricia and Walter for dinner at one of my favorite spots in town, Boat Street Café. There are two seatings, 6:00 and 8:30, on May 14. Call the restaurant directly (and SOON) to reserve your $95 place at the table. A preset menu includes asparagus salad, braised chicken with baby peas and baby turnips and meringues with strawberry-rhubarb compote. I’m there! They’ll also be doing a book signing up on Orcas Island the next day, at Rose’s Bakery & Café in Eastsound. More details on the book and their nationwide tour are here on her web site. Hint: next time you’re heading to Paris, check out her site for great insider tips on best restaurants to work into your itinerary. 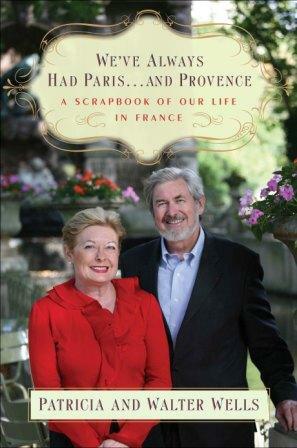 A little over 25 years ago, Patricia and Walter Wells made their way to Paris to work for the International Herald Tribune, him as an editor, her as the restaurant critic. Their life this past couple of decades has been the stuff of fantasy! Not only living in Paris, but exploring every nook and cranny of the city, and the country, doing important food research. Eventually, they bought a lovely, relaxed home in the south of France, complete with garden and vineyard, strolling through the town’s market, lazy dinners on the patio under the trees. (heavy sigh) Surely their book is packed with phenomenal, personal stories and adventures, I can’t wait to read it. My history with Patricia is one that proves that with the right mentors, anything is possible. In college, while I still thought I’d be an engineer when I grew up, and throw great dinner parties on the weekends, I took one journalism class about features writing. Professor Ragsdale was right out of central casting…grizzled older journalist, floppy trench coat, ragged but sturdy leather valise, world-weary but jovial crinkles on his face, grey hair. I adored him. I brought up in class one day that an area of personal interest was food, especially French food. He said, “You should get in touch with one of my former students, Patricia Wells.” I nearly fell off my chair. 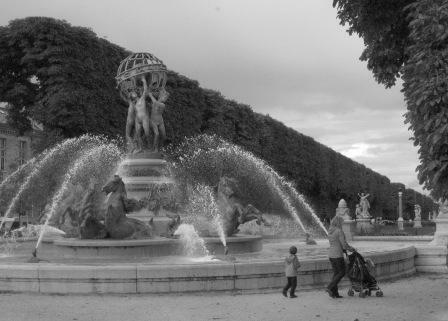 I’d been to Paris for a monthlong class with my French program and her Food Lover’s Guide to Paris was already my bible. I wrote her a goofy fan letter, told her I was beginning to think about getting into food writing. She wrote back the nicest note, very encouraging, said not to let anything get in the way of me realizing my dreams. That already would have been enough. Fast forward a few years. I get to France to study at La Varenne cooking school and call or write her to say something like “hey, remember me? I’m in France now! Let me know if you need an assistant or anything…” Yeah, goofy again. She kindly said, not now, thanks. A year or so later, I get a phone call. From Patricia Wells. Telling me that her assistant was leaving and did I still want to work for her? Again, I nearly fall off my chair. I could only swing 6 months or so working with her in Paris, given work obligations I had down at Château du Feÿ in Burgundy (whine, whine). But it was a great 6 months! She was polishing off her cookbook with Joël Robuchon and working on updating the Paris guide. I relished every moment of my time working and studying at La Varenne. But to be able to inject that episode of my life with some time working for Patricia Wells? It was homemade rich vanilla buttercream frosting on the cake.